The magazine is a high-end publication written by Finger Lakes insiders. It includes a long list of outdoor activities to try while visiting the Finger Lakes, including hiking, biking, fishing, hunting, swimming, skiing, hang-gliding, and many more. The magazine includes mentions and photography from all 13 counties participating in the program. 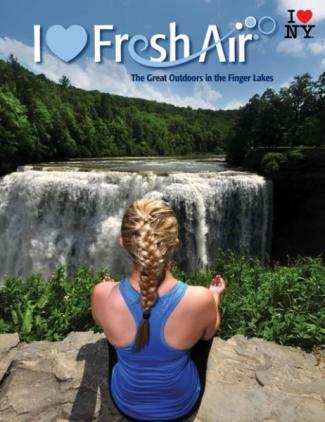 LoveFreshAir.com compliments the magazine by providing a listing of locations in the Finger Lakes where visitors can find outdoor activities. Broken up by activity and by county, the website provides an easy way to browse through listings based on interest or desired destination. A trip planner allows visitors to the site to save destinations and map out their adventure. A geo location tool has also been built into the site, to give directions and guide visitors who are on the go. The website is available on both desktop and mobile platforms. The breathtaking Finger Lakes, takes its name from eleven lakes spanning the region like a giant handprint and boasts a great mix of trails, natural beauty and cities and villages offering treasures of history and culture. For information about attractions and events throughout the Finger Lakes region, visit www.fingerlakestravelny.com or call 1-888-408-1693.